You can make your very own alfredo sauce and can it! You will need: 1/2 pound butter, 16 oz cream cheese, 12 oz grated parmesan cheese, 2 quarts milk, 5 teaspoons garlic powder, 1/4 teaspoon pepper. In a large pot over medium low heat, combine butter and 1 qt of milk, heat until butter is melted. Add in cream cheese, a little at a time, and stir until melted. Add the other quart of milk. Add your garlic and pepper, and start adding the grated parmesan cheese a little at a time. When the parmesan cheese is melted, ladle sauce into pint jars. The sauce will seem very thin - it thickens during canning. Pressure can for 5 minutes at pressure for your altitude (that's 10 pounds for me). Upon opening, the sauce may have separated a little. Stir it back together and it'll be fine. Warning: Pretty much no one recommends canning dairy products. You should proceed at your own risk. This stuff looks ugly in the jar but it sure is tasty. I've used it a year after canning and it was still good. I love to combine a pint of this sauce with half a box of cooked pasta. You can add some canned chicken or fresh chicken if you like. I put it all in a 8" casserole dish and sprinkle with shredded cheese, and bake at 350F for 30 minutes. 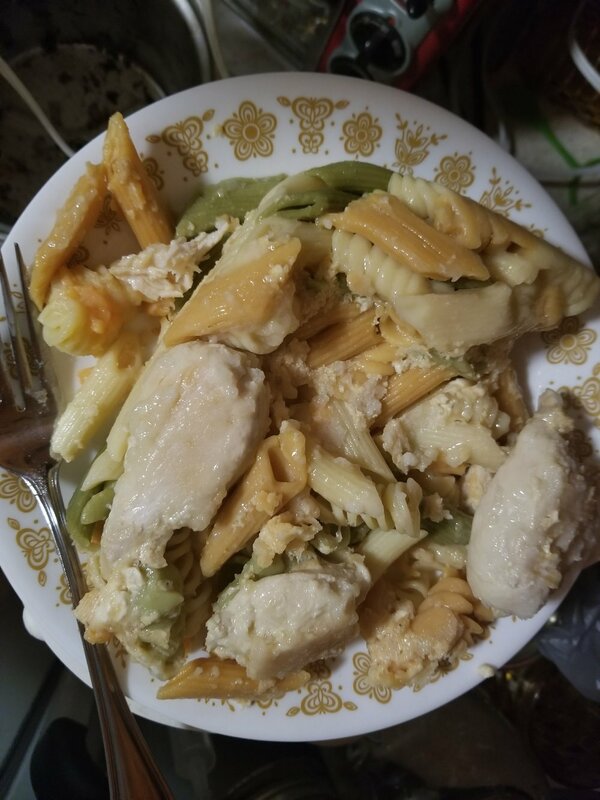 It makes a tasty baked chicken alfredo dish that my husband just loves!